These juice recipes combine sweet root vegetables like beets and carrots with fruits and berries producing complex taste and flavor. Enjoy! Trim and wash the beets. Peel the carrot. Cut beets and the carrot into 2-inch pieces. Process all ingredients in a juice extractor. Rinse apples and cut into sixths. Scrub beets; discard tops if wilted or use them if fresh. Rinse and quarter pear. Peel lemon. 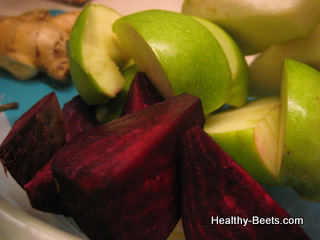 Push apples, beets, pear, lemon, and ginger through the juicer to process. Stir well and pour juice into two glasses. Serve immediately, garnished with apple wedges if desired. To pulp this recipe in a blender or food processor core apple and pear, remove seeds from lemon, and cut all ingredients into pieces no larger than 1 inch. Rinse strawberries. Scrub beets well, discard tops if wilted but rinse and use if not, and cut into 2-inch cubes. Rinse celery, and cut into 2-inch lengths. 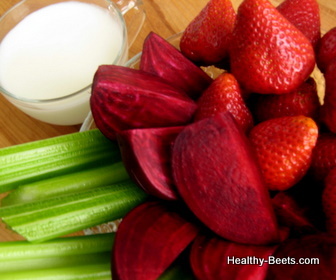 Push strawberries, beet, and celery through the juicer, and process until juiced. Pour juice into a blender, add yogurt and jam. Blend for 30 seconds, and pour juice into two glasses. Serve immediately, garnished with strawberries if desired. To pulp this recipe in a blender or food processor, remove tops from strawberries and cut all ingredients into pieces no larger than 1 inch. If using a blender or food processor, add yogurt and jam with other ingredients.